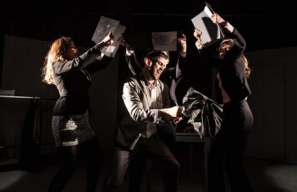 In the middle of watching Hyperdrive Theatre’s fringe production, Dreamland, I am struck with the realization that there is much to be said for the similarities between the cut-throat world of stockbroking and that of theatre-makers. Indeed, being positioned behind the Manning Corp CEO’s desk hearing “you have 15 seconds to sell yourself...12” I am suckerpunched by a similar feeling to Edinburgh Fringe flyering. Dreamland is set in the turbulent world of 2008 London, following the year’s disastrous economic recession. This is an ambitious subject, and Dreamland taps into the possibilities for human cruelty, when we are threatened with failure. They very pointedly ask the audience from the start, ‘who is responsible for a crisis?’. While I am pulled in by this set up, and the mounting sense of drama and devastation that this time period promises...I can’t help but feel a little disappointed by the angle the script focuses on. The story of a wide-eyed young, white man rising to power and wealth through immoral but “devilishly charming” actions feels extremely played out. Nonetheless, Dreamland does it’s best to circumvent cliché with complex supporting characters and an engaging setting. Manning Corp itself serves as an excellent narrative battlefield, and a good entry point into the atmosphere around the financial drama, making the world around the business feel more fleshed out. Make no mistake though, there are bits of very smart writing peeking out of the script. For example, when one character needs to explain their idea about generating income through a mortgaging scheme Dreamland gives us this information through a character performing a ‘practice interview’ that makes all of this explanation feel natural and more visually interesting. In fact, visually is where Dreamland deserves the most praise; cast and crew of Hyperdrive Theatre pay very close attention to details and pacing and it shows, brilliantly. Dreamland boasts spot-on transitions that feel mesmerizingly slick,beautiful costumes (complete with custom ID badges for every character), and a gorgeous soundtrack. Moreover, Dreamland employs the use of compelling physical theatre, and I can say confidently that these sequences were some of the best representations of how to do an on-stage version of a cinematic montage I have seen. Ever. However, this cinematic quality seems to be a double-edged sword for Dreamland. From the marketing, to the script’s angle, the production feels entirely too reliant on its influences (The Wolf of Wall Street being referenced right on their poster). Slow-mo, champagne spraying, rampant drug use, and non-diegetic character monologues made the piece feel like it was a stage adaptation of the Scorsese picture with a British accent. Which is a shame because there are moments where Dreamland starts to find its own identity outside of its cinematic crutches...and when it does it truly shows off the impressive talent and creativity of its cast and crew. I leave wishing the piece had trusted it’s own path more, but with extremely high hopes for the success of this young company. Because what Dreamland lacked in identity it more than made up for in acting prowess, design, and direction. Dreamland is performed at the Zoo Southside venue at 3pm till the 27th.